I'm always picking up "new to me" hand creams, and I recently picked up a couple of 1 oz. tubes of Carmex Healing Lotion to carry in my bag. The original Carmex in a jar has been a staple item of mine for a long time--something I reach for when my lips are especially dry from the cold winter months or the skin-parching days at the beach during the summer months. Carmex recently introduced their Healing Lotion and a Healing Cream, which sounds like a more intense version of the lotion. I love how quickly this absorbs, and there is absolutely no trace of greasiness in the formula. The scent is very light, but it does smell a bit like the lip balm, if you're familiar with that product. This lotion however, has a lighter menthol scent and a hint of cocoa and vanilla, resulting in a light, soothing fragrance. It's packed full of moisturizing ingredients such as aloe, lanolin, vitamin E, and cocoa seed butter. It also contains beeswax to retain moisture. The formula is quite thick, and I was pleasantly surprised by just how soft it makes my hands feel. I've also been rubbing it into my cuticles for added moisture and softening. If you're looking for a new hand cream, check this one out. It's available at Walgreens and drugstore.com. Wow, I've been using Carmex lip products for years, but I can't believe they make lotion now! I'll have to check this one out for sure! Wow if it's anything near as amazing as the lip balm then it's a must have! I'm definitely gonna go get that lotion. Although I don't too much care for the smell of it, my lips are addicted to carmex. It moisturizes so well. 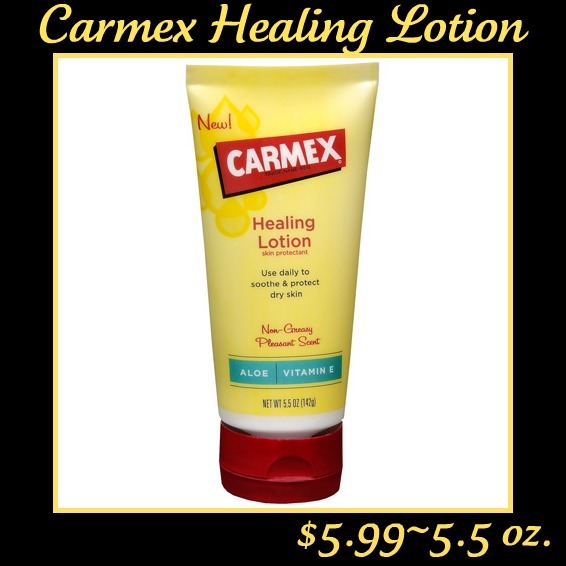 Love the Carmex Healing Cream. I bought it on Monday, it has done wonders for my hands. Thank you for reviewing it. Well worth the $5.99 cost for four ounces.